That's right: Serge and Coleman do spring break! It's been a long time coming, but they're at the party now - and you¹ll never look at a Frisbee the same way again. One spring break location obviously isn't enough for Serge, so he must hit them all, traveling through various historic locales, spewing nuggets of history at anyone who won't run away and dispensing his own signature brand of Sunshine State justice. Along the way, he and his sidekick, Coleman, attract a growing following of the nation's top college students and a mysterious gang that leaves a trail of young bodies in their wake. Are the kids safer under Serge's protection? Or does being with him put them in more peril? The classroom and the pot brownies never prepared them for this. Which raises more questions: Who's the guy studying satellite photos? Where did the protected witness go? When did Coleman get all those trophies? Why are the Feds hot on everyone's trail? How did the burnt corpse end up by the pool? What's the best way to keep beer cool on the beach? Honestly this is one of the authors you either love or hate you cant actuly be on the fence. In my opinoin I think he is amazing!! My favorite Serge adventure to date! I can't get enough of the fast paced humorous style of these books and I think this one has the strongest storyline. I also have to say I'm a big fan of Oliver Wyman, with his big number of different voices. It's probably not for everyone (my girlfriend's not a fan) but I absolutely love this serie!! A brilliant author, a masterful narrator, and characters you have to love. Serge and Coleman are back and as good as ever. Had more of a rustic feel to it. What did you love best about Gator A-Go-Go? New characters. Even though they probably won't stay in the series it's nice to see Serge making new friends. Oh yeah. Tim can keep a story moving. Much more animated and diverse with voices. I can't take in a book or audio book in one sitting! If you don't believe the stuff Tim writes about Florida, you've never been here. What a fun listen. All expat floridians and floridaphiles will really get a kick out of this book. Coleman has come into his own! What was one of the most memorable moments of Gator A-Go-Go? College students chanting Coleman's name! I have listened to Dorsey books with both Wilson and Wyman narrating. At first I liked the smooth consistent reading of Wilson and couldn’t understand why Recorded Books would want to mess up a good thing. After listening to Wyman’s high energy, I really appreciate the diversity and consistency of his character voices (He does some great accents). Like another reviewer mentioned, Surge sounds like Joe Pesci... but it works for me. I didn’t think I would like a Wyman’s readings after hearing Wilson first, but now Wilson sounds a bit lackluster, although more stable, after listening to this novel. The story is okay; not as good as others like Florida Roadkill. It gets real predictable near the end and wraps up too quickly for my taste. 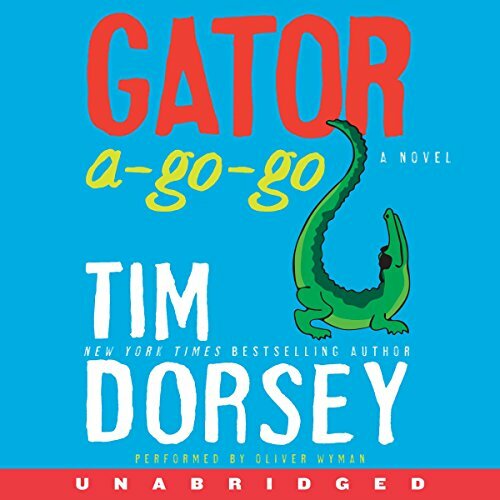 If you are a fan of Dorsey/Hiaasen then this book should be on your audible.com bucket list somewhere near the bottom. 6 sur 20 personne(s) ont trouvé cet avis utile. I have listened to over 200 books on Audible. There have been a few I didn't care for but this is the first time I wanted a refund. This book was horrible. It should have been called "Dumb and Dumber become Serial Killers". I had to gave it one star because it wouldn't let me give it zero.